Problem with 360 crank twin cylinder engines is they are a natural air pump. Any ideas for to improve breathing without blowing out oil or oil mist I am sure will be welcome. 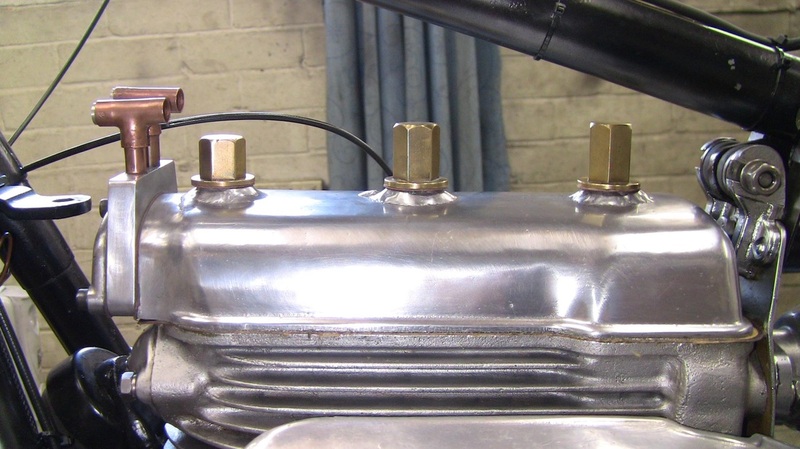 Timed breathing is a requirement on this type of engine, in other words the air is blown out of the crankcase on the downward stroke of the two pistons through the disc valves in the cam cover. 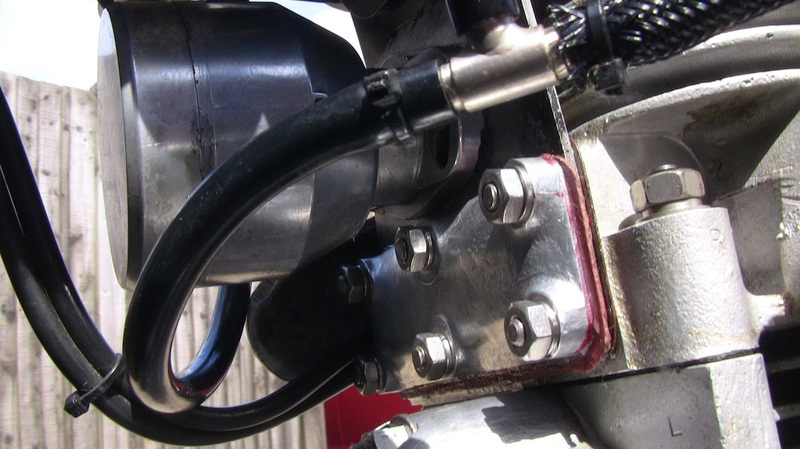 On the upward stroke the valves are closed through suction and the crankcase will be at negative pressure. 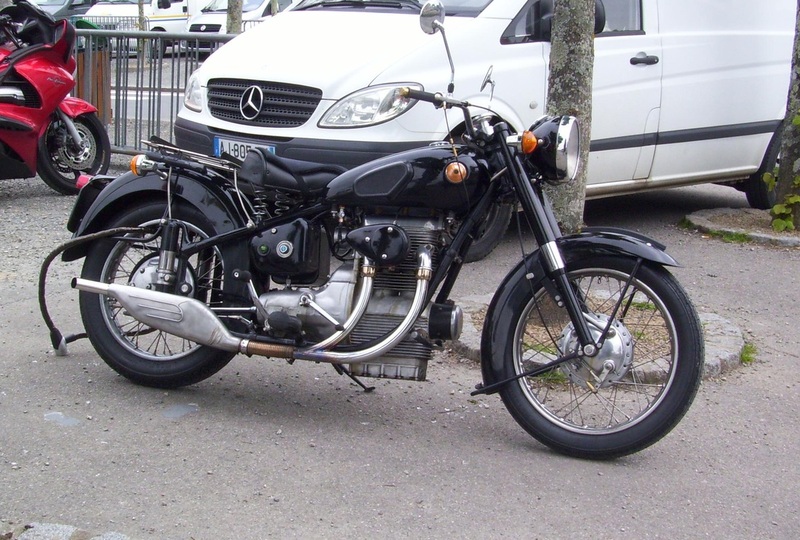 I found that on a long run from Calais to Normandy at 60 mph that the twin breather with pipes shown in the photos remained oil free. I also found with the experimental long nuts holding the cambox cover on that the cambox had condensation in it so that the cambox was overcooled. This led me to think there must be a considerable cooling air flow over the camcover at speed. I also think the fuel tank tunnel adds to this air stream. So I discarded the plastic pipes and have fitted tee pieces to the breather stubs. This idea is based on the venturi principle so that at speed the air in the cambox is 'sucked'out therefore reducing back pressure...........We shall see ! First breather with plastic pipes. Checking the clearance under the fuel tank. 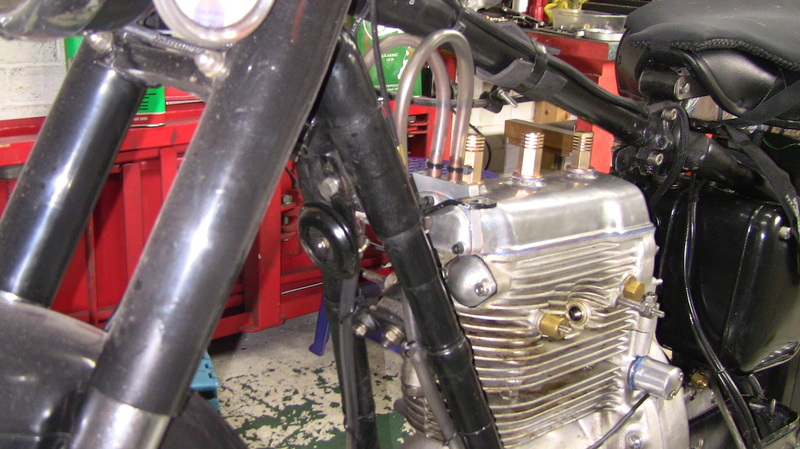 The lowest nut behind the breather pipes so air flow through venturis is smooth. Pictured above : Parked at St.Mer Eglise, only oil leak was from camchain cover plate. ( Easily sorted ). Upper picture : It would appear that after three hundred miles at speeds of 55 to 70 mph that this breathing modification works. The bike ran from Hertfordshire to Portsmouth in the company of a Honda ST 1300 at 65 mph with only one stop. 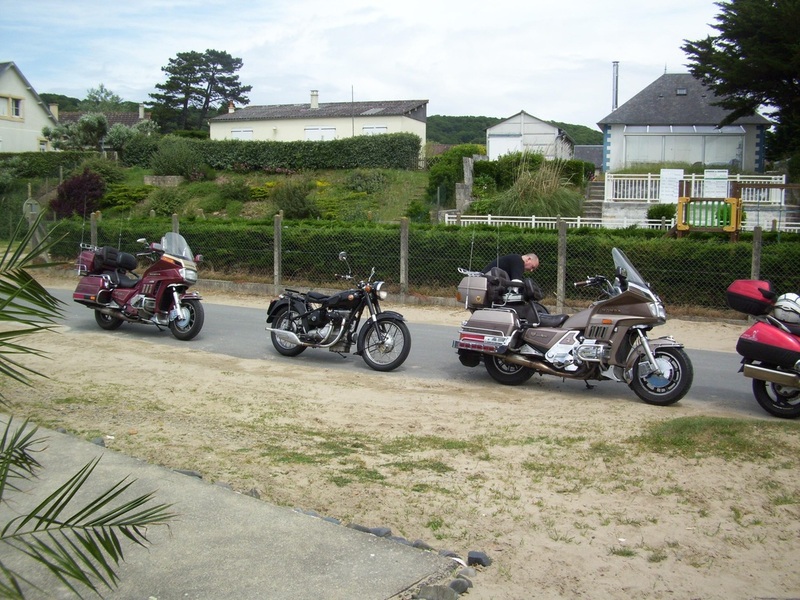 Then Caen ( France ) to Avrances again at 65 to 70 mph with three big Hondas. Total miles for the week 650. 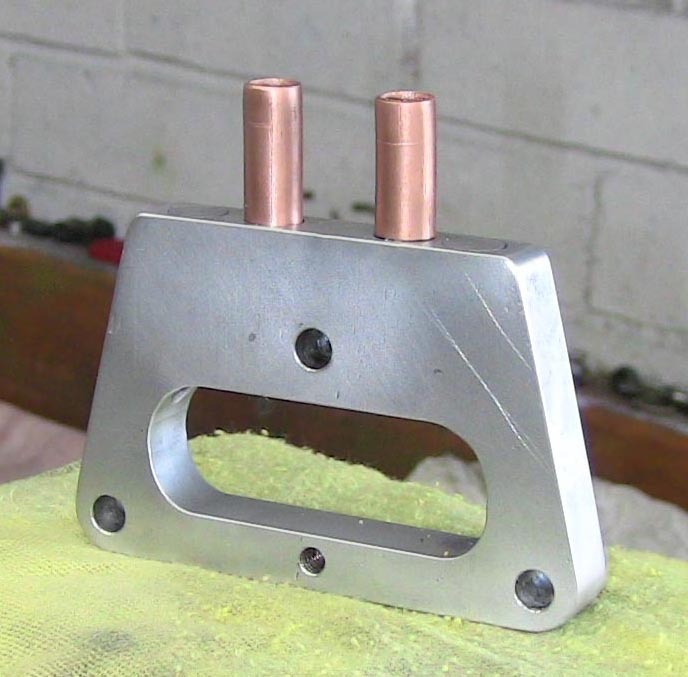 On various pages on this website are references to modifications to the cambox cover and to the oil feed to the camshaft.... Sequential tightening of the cylinder head nuts.... Flatness or trueness of the cylinder head and block. These all come together to ensure an oiltight engine One oil weep that seems to catch people unawares is the camchain inspection cover. 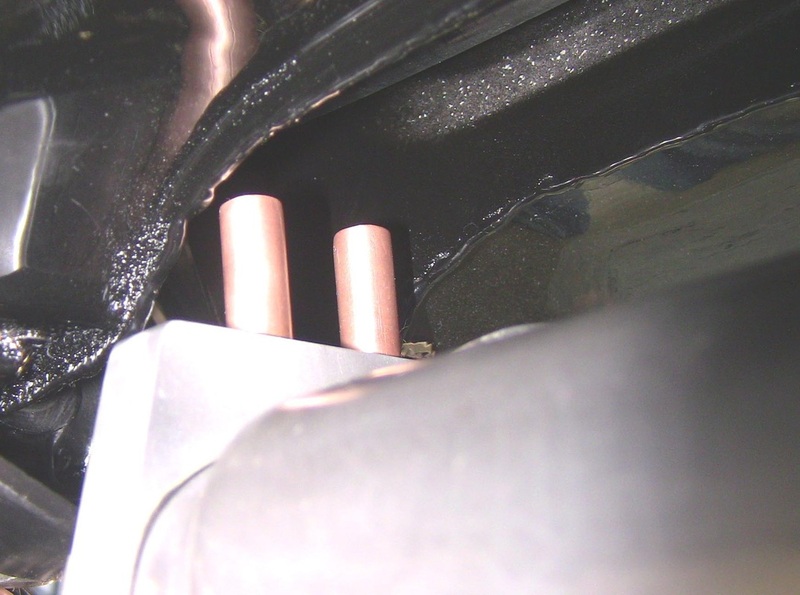 If this is warped a tiny weep drips down the side of the engine on the spark plug side and rests on the little cable lug for the clutch cable. No use tightening down the cylinder head nuts ( probably warping the cylinder head ). Answer is flatten the inspection plate on a mirror or plate glass with a touch of grinding paste. Flattened oiltight camchain inspection cover, only grease used on the oilite gasket paper.